As Star Wars is enjoying a rebirth (of sorts) and an entire new generation of fans, great video games have been released for the franchise. The Clone Wars is the hot new cartoon series that is spawning many of these games, and with the revolutionary control system of the Nintendo Wii, using the force and swinging lightsabers has never been more fun! To get the most from the games, a few Wii accessories are essential. I’ll show you what these accessories are, and different options for each type. The two key functions that these accessories cover is shooting the blaster and swinging the lightsaber, these are also the two most common elements of Star Wars games for Wii. A Wii gun is necessary for almost any shooting style game. The most popular is the Wii Zapper, that is made by Nintendo. It also comes with a cool game that teaches you how to use the gun, hosted by Link from Legend of Zelda. If you want to keep everything in the Star Wars family, check out the Clone Trooper Blaster. This is licensed by LucasFilms, and made by Nintendo. It works exactly the same as the Wii Zapper, but is branded Star Wars, and is a few bucks cheaper since it doesn’t come with the game. Any of the Wii guns that are on the market will also work the Star Wars games, so if you already have one, another isn’t necessary (except for multiplayer). To control the lightsaber, check out the Official Anakin and Yoda Light Up Lightsabers. These things are almost cool enough to buy without owning a Wii! They hold the WiiMote in the base of the lightsaber, so your other hand is free to control the Nun Chuck. The pack comes with two lightsabers, so you have enough for a friend to play along. While the lightsabers are unique to each character and light up different colors, they both function the same. There are also third party manufacturers of lightsabers that are available, and cost a few bucks less than the official ones do. For the Star Wars nerd, there is also a Darth Vader sensor bar holder. It is a small statue of Darth Vader that holds the sensor bar inside his lightsaber. Very cool for the serious fan, but provides little added functionality. 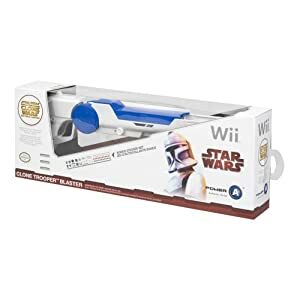 Wii Star Wars accessories are a necessity for making gameplay as real and fun as possible. Luckily it only requires two different styles, so no major investment is needed. They are also compatible with all of the current Star Wars games.